I stumbled upon your blog post several weeks ago and bought the book. I thought I come back and leave a short review, it’s really great! I’m only 2 chapters into the book, but so far its great. 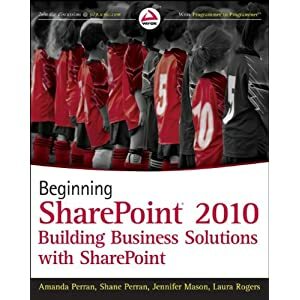 I have read several SP 2010 books in their entirety, so I’m used to the quality of what is out there and while none of what I have read is bad, alot of it isn’t as straight forward as this book. I love the try it out sections – very unique! I’ve searched through the table of contents and index as well as the coverage of topics is very good – comprehensive! For me, a developer for the most part, this book comes in handy to let me know and try out alot of the functionality that exists through the front end of the product. Development in SP hides in the background and emulates alot of the UI based functionality, but its great to know how to do it both ways. Top that with knowledge of governance and decisions and you too can be a SP analyst!